Today is another blog-related post for you. I will be first to admit that juggling two blogs and a full-time job can be very tiring sometimes. Pretty much the reason why I neglect some important aspects that the blog needs to look good and to gain some legit traffic. 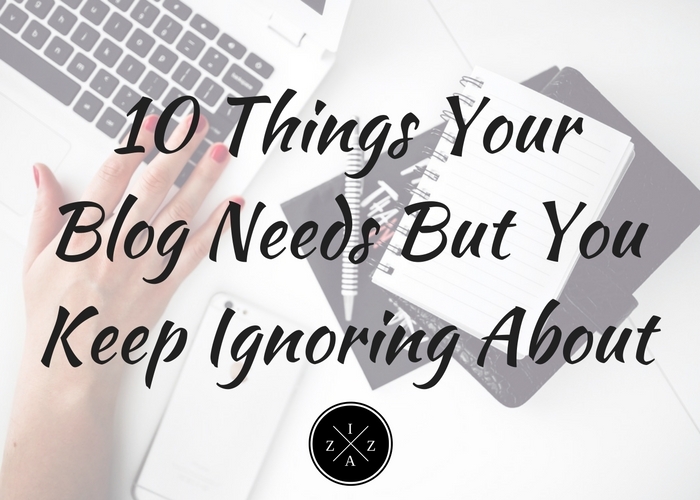 And so to set as a reminder for myself and to others who've been into blogging too, I created a list of 10 Things Your Blog Needs But You Keep Ignoring About. May the list give everyone motivation to blog for the better. Let's begin. Its important for your blog to look good in your readers eyes and the only way you can do this is by investing on a good blog theme. There are plenty of free templates you can search online for your blog to have a better visual presentation. Try to spare your blog on a lot of ads as much as possible. Keep it as simple and as focused on the content first. Your sidebar should be as organized as possible containing only the best widget that your reader needs. Pop-ups can be a little annoying too so if you can keep it clean and simple do it. You also need a page to introduce who you are and what you do. The About Me Page is as always easily forgotten by a lot of bloggers but it shouldn't be the case. Your About Me Page will help your readers get to know you better and relate to your blog more. It can be an in-depth story about you, how your blog started and what your plans are in the future. If there's something I've been ignoring a lot in my blogs it will most probably be an email list especially on my personal finance blog, SavingsPinay. Building a solid email list starts from Day 1 of your blog. Email subscribers can turn as loyal readers and followers of your blog in time. Also they can be your first list of potential buyers if ever you release an infoproduct or service. Media Kit will get your blog closer to brand sponsorships and ad placements. Its an overview of your blog's status and reach and should be updated on either 6-month or yearly basis. Even if you are a small blog you still should consider creating a media kit readily available in case a PR or Marketing expert will need it. What should be inside your Media Kit? Its important to give a few words of introduction about you and your blog. It will also be nice to include your current photo for reference. Who are your audience exactly? Who reads and patronizes your blog? This is important to be part of your media kit so they can assess the right product and/or service to connect you with. For example a baby food company will probably not work with someone who's audience are women in their teenage years. They would want a readership with a lot of mommies and family-oriented group. C. Your Social Media Reach. PR and Advertising Personnel rely now most on the social media presence of a blogger. You need to include how many people follow you on Facebook, Instagram, Twitter and the like. This will showcase whether you can really be a good investment for the brand. Your blog's statistics like over-all pageviews, monthly views and daily traffic is also important to be part of your media kit. This will serve as a guide for people to acknowledge your blog's presence online. If you haven't tried setting some clear goals for your blog then you should probably do some now. Goal setting gives you a better perspective in your blogging career. It drives you forward, unleashing your highest potential as a blogger. Writing your goals will also enable you to know what your next actions will be. You can easily make necessary actions to turn your blog into something extra special. I admit that I'm not the best in keeping with my goals but I realize that the more I write and dwell on it the better. I had this certain aura within me that I can achieve it. If you notice most blogs that are on top they have this Author Profile at the end of their posts. This is a nice addition to let your readers remember who you are. Mine has been available but I keep ignoring changing it. My bad. Make sure to include a little bio and all helpful links as well as your email on this portion. How do you blog? Do you write and publish on a spur of the moment? If you want more blogging peace you need to create a schedule for yourself. From the number of posts you'll publish a day and when to doing all your blog tasks. You can visit My Weekly Writing Routine for reference. As a blogger for the past four years and counting I know for a fact that the blog won't function without me. I have to take action if I want the blog to stay active. Your blog needs you, your time and your effort to succeed. Blogging made me believe in the saying "If you do what you love, you'll never work a day in your life." One day I want to focus on blogging alone and just do it for the rest of my life. I hope this post help. Use the comment section below for your question, opinion and reaction. Leave a link to your blog too!